Beginning in the early 1800’s, the Commonwealth of Massachusetts began constructing a state-wide system of cutting edge (for the time) insane asylums. Construction on the Worcester Insane Asylum began in 1832, with the grand opening in 1833. The centerpiece of the new hospital was an elaborate administration building topped with a 135’ tall clock tower built in 1877. The Victorian-era facility in Worcester was officially closed in the early 1990’s with several phases of demolition taking place over the years. The administration building with its’ famous clock tower was one of the last remaining features of the original complex and was scheduled to be preserved. Unfortunately, a fire in 1991 caused significant damage to the interior structure and rendered the building inaccessible. 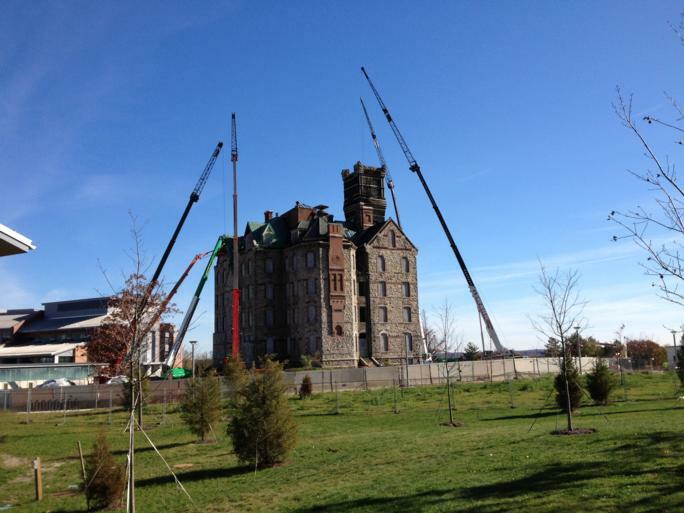 The desire to preserve the structure was balanced against the need to prevent a dangerous collapse, and a decision was made to deconstruct and re-locate the clock tower on site as part of the new $300 million, 300 bed Worcester Recovery Center & Hospital, as a tribute to the historical past. The Massachusetts Department of Capital Asset Management and Maintenance (DCAMM) hired Gilbane as a General Contractor and Construction Manager to oversee this work. Together with DCAMM and Gilbane, Costello Dismantling created a work plan to address the challenging scope of work and the sensitivity needed to work adjacent to an occupied hospital. To achieve these goals, the team employed over 20 subcontractors including engineers, health and safety professionals, masonry restoration experts, clock repair specialists, and environmental remediators. The deconstruction was a painstaking process that involved removal of each stone by hand, numbering, photographing, and cataloging them so the tower could be re-erected properly. The entirety of the top 65’ of the tower was saved in this way, along with a significant portion of the remainder of the building. The deconstruction and demolition team consisted of a crew of 17 masons, 13 environmental professionals, 15 demolition specialists, 2 engineers, and 4 full-time safety officers working together to create a successful project. One of the most difficult challenges involved the extreme height that crews needed to work at to recover the tallest portions of the tower. The City of Worcester Fire Department would be able to perform aerial rescues at heights up to 70 feet. This project involved months of work at heights up to 135’, using 150’ boom lifts and manbaskets suspended from cranes. A mechanical failure at height could leave workers stranded with no outside rescue available. To safeguard against this, we always had at least two lifts on site capable of performing a rescue at any height and a specifically trained Aerial Rescue Team comprised of key site personnel with defined roles and responsibilities in the event of a rescue. We had to make use of this special training once, when we encountered a mechanical failure at height in one of the lifts. Over the duration of the project there were zero loss time accidents. A falling debris engineering study was referred to which located the potential fall zone of debris from the building within a radius of 40% of the building height. This raised concerns as to the proximity of the newly occupied hospital which, in places, closely challenged this fall zone. Intrusion into the hospital “space” was an absolute prohibition to the basic tenets of the work plan. Several critical factors came into play, then, when executing a demolition plan. It became apparent that the slate shingle roofing could become loosened and airborne during roof demolition and could potentially sail out of the exclusion zone. We designed a mesh wrapping system around the eaves of the clock tower which would capture any fugitive slates and contain them safely. Similarly, once the tower portion of the building had been removed manually, the body of the building remained for dismantling with significant portions of the field and decorative sills, lintels and quoins needing to be saved. As previously mentioned, a significant fire in 1991 had rendered the interior of the building structurally deficient, inaccessible, and asbestos contaminated. All work activities were performed from the perimeter. We utilized two Volvo High Reach Excavators as the primary demolition machines. A Volvo EC 700 with 105’ of boom and a Volvo EC 460 with 85’ of boom were both equipped with rotating grapples to carefully dismantle wall sections and place individual stones in designated areas for decontamination and recovery. The precision material handling control was absolutely essential to maintaining our tight working envelope. The reconstruction of the lower 65’ of the new clock tower monument required 8” thick ashlar granite stones to achieve finished exterior elevation. Although some of the salvaged stones were within this tolerance, we discovered that the lower on the building face we went, the thicker the stones were. We regularly encountered stones over 12” thick. Rather than sort through thousands of stones to find 8” minus thickness, we collected the 4000 square feet required for the new construction (nearly 4000 stones) and sent them to a local stone fabrication shop to have them saw cut to the required thickness, palletized, and sent back for the new project. The time savings achieved by opting for this solution easily outweighed the expense of sorting. This project was truly a collaborative effort, with Gilbane and DCAMM working tirelessly to manage the safety and efficiency of the expansive construction and demolition site. Four full time safety professionals from the prime contractors and subcontractors worked together to create a healthy and functional job site. While demolition was ongoing, construction was completed on the brand new hospital adjacent, with demolition temporarily paused for the grand opening. After the opening of the new hospital, the task became ever more strenuous, with all three parties (DCAMM, Gilbane, and Costello) working together to protect the safety and privacy of patients as the adjacent building became occupied. Demolition was completed in March, 2013. In total, over 13,000 manhours were logged on just the tower deconstruction, remediation, and dismantlement, with zero loss time accidents. Costello Dismantling, Gilbane and DCAMM worked collaboratively to craft and execute a successful deconstruction and demolition plan. At the present time, the clock tower monument has not been constructed, but all the raw materials harvested from the original structure are catalogued, numbered and ready to build with, capping off the new hospital with a terrific tribute to the past. On October 31st, Costello Dismantling won the Collaboration Award at the 2013 World Demolition Awards for this project. Thank you to the judges, the sponsors of the event, and the wonderful team that made this project possible.